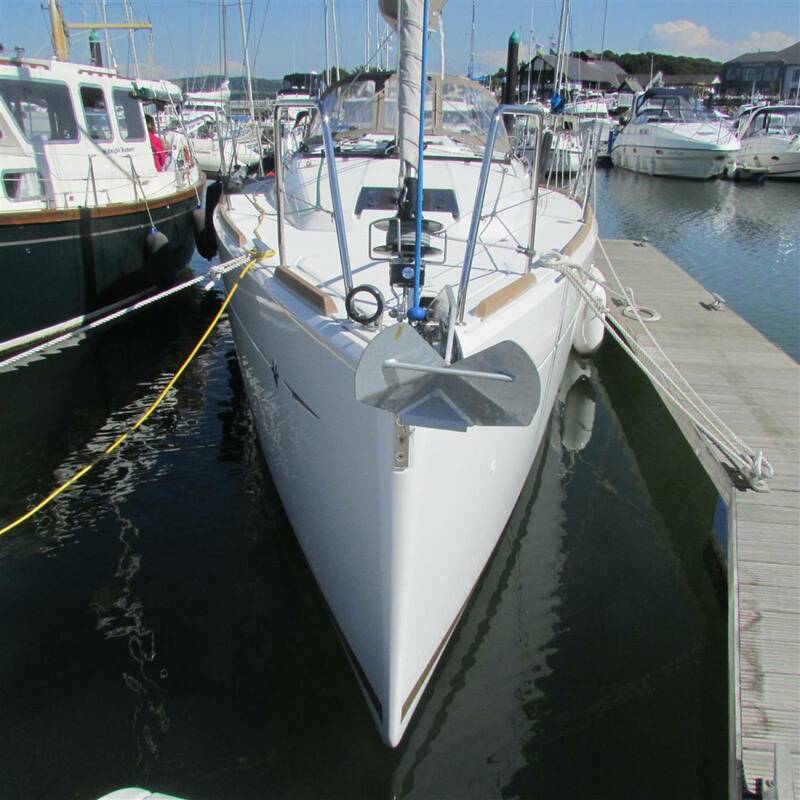 Offers over £95,000 - This Popular Jeanneau Sun Odyssey 349 Yacht is the latest model introduced in 2016 designed by Marc Lombard for Jeanneau. 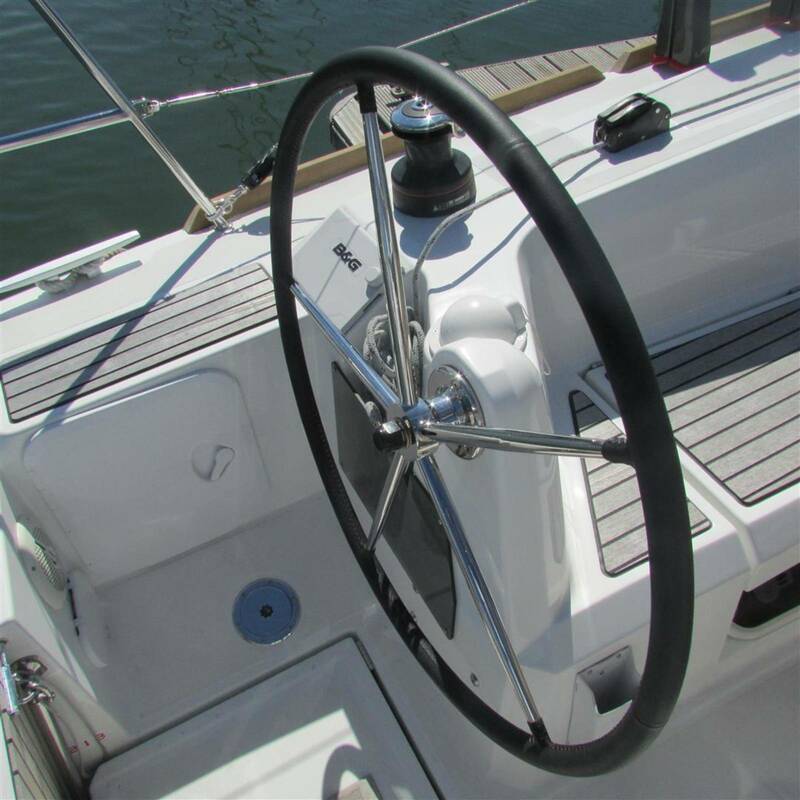 The Popular Twin Wheel Configuration follow's the rest of the Jeanneau Sun Odyssey range. 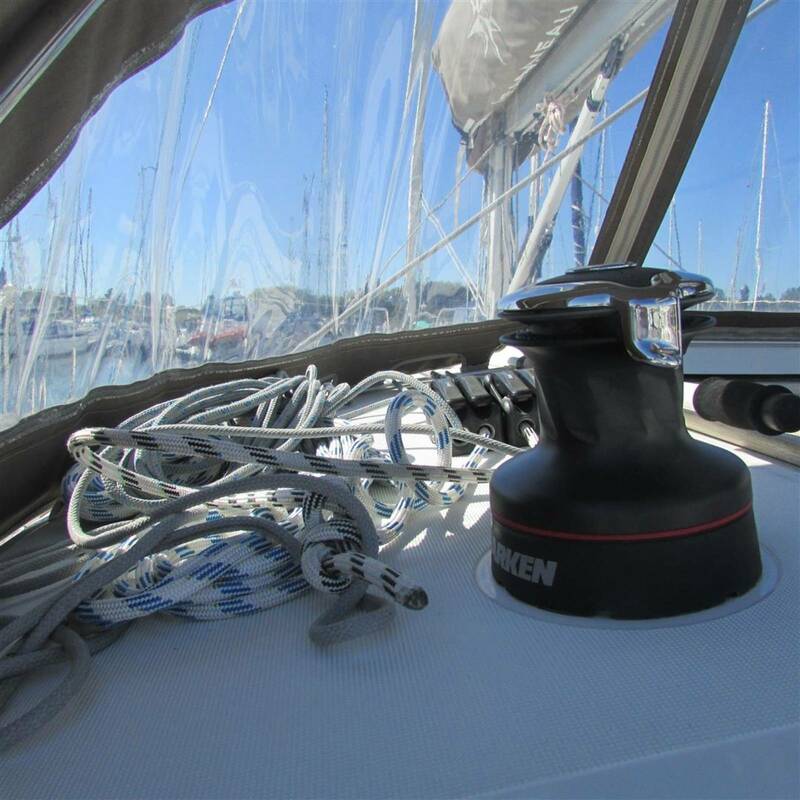 Designed for sailing with few hands providing an exciting sail experience for Skippers of all levels. 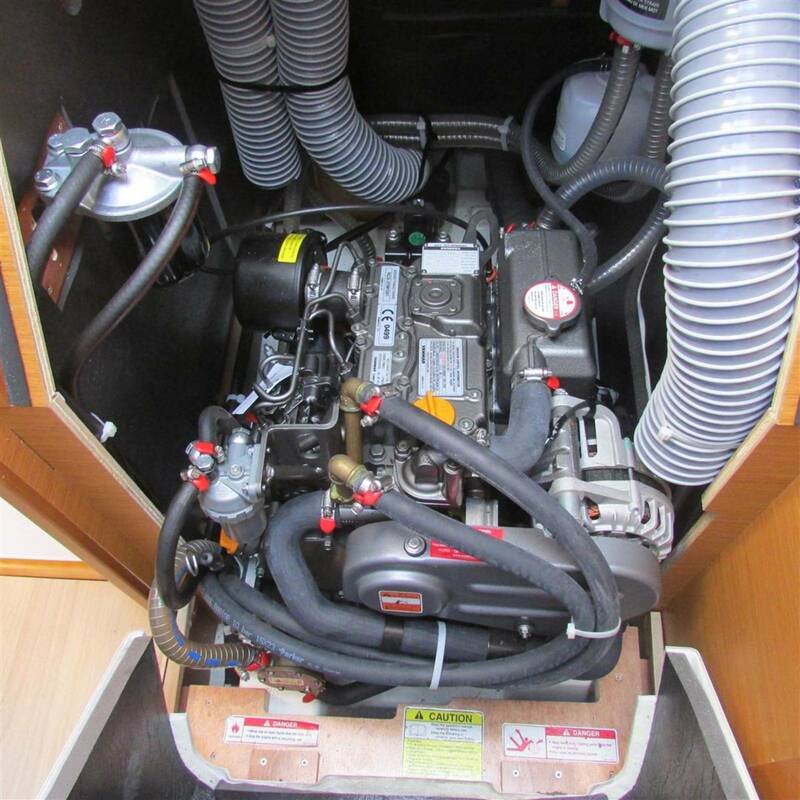 Benefiting from the latest technology in hull design featuring prominent hull chine for added performance, stability and control. 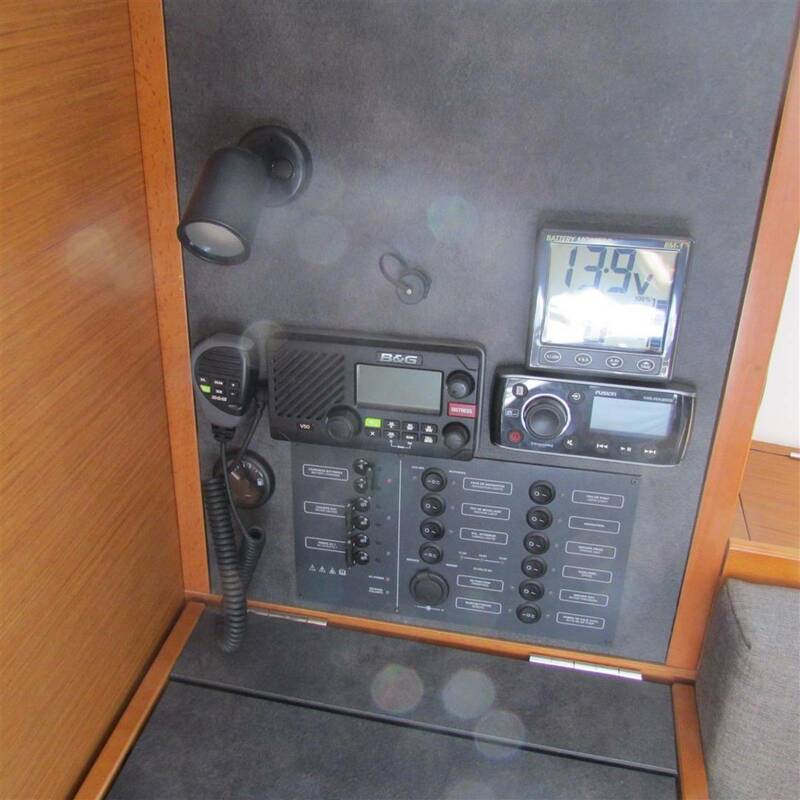 Another benefit of this hull design can be seen in the accommodation below. Further stability and enhanced handling has been achieved through the use of the advanced Prisma Process. 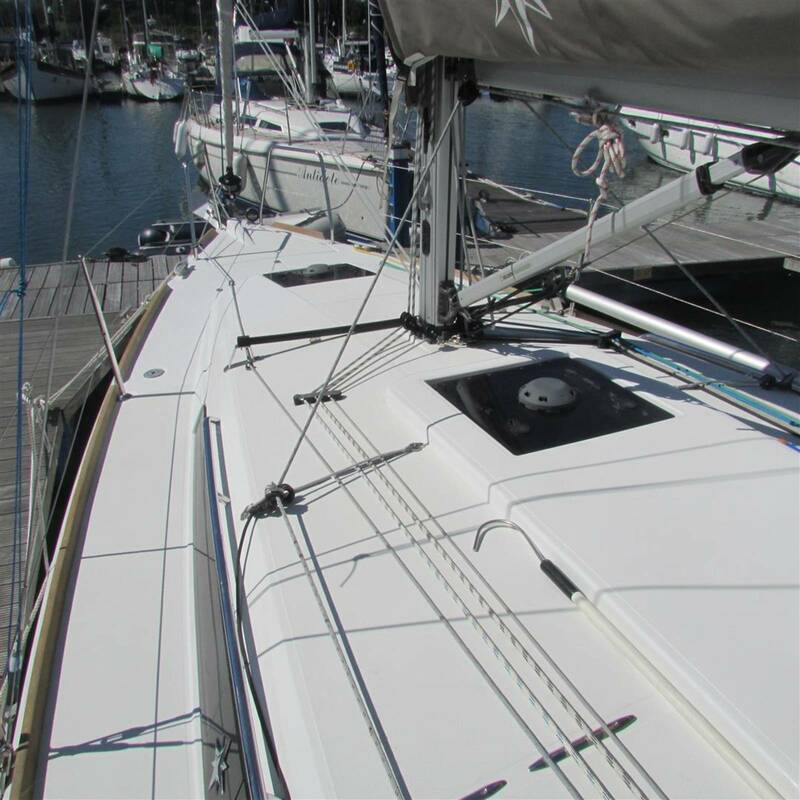 Producing injection laminated decks resulting in less deck weight and reducing the requirements for a heavy keel. 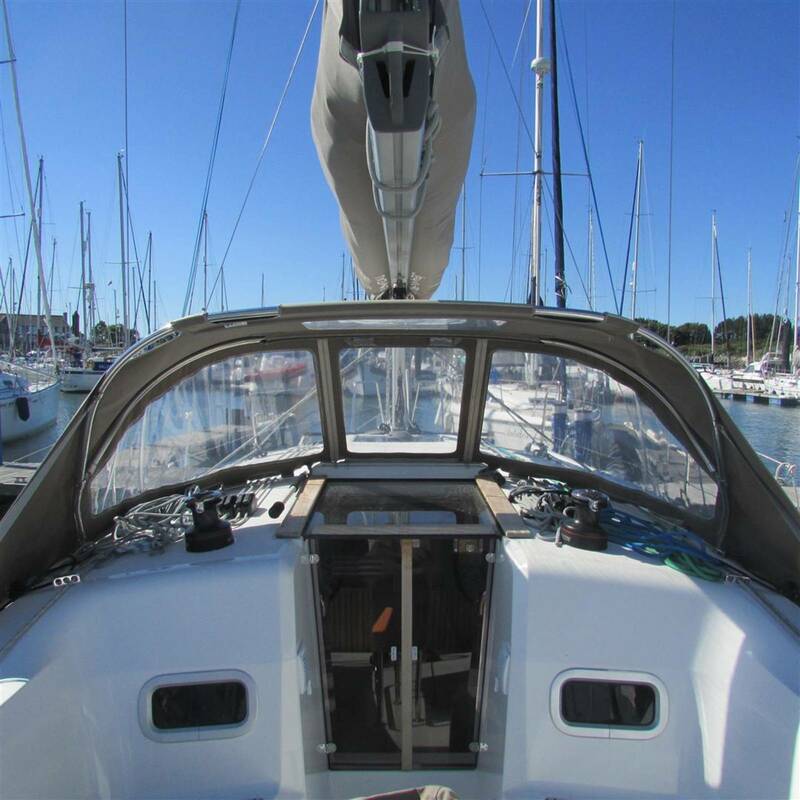 The Jeanneau 349 features twin rudders ensuring excellent control whilst sailing at any angle. 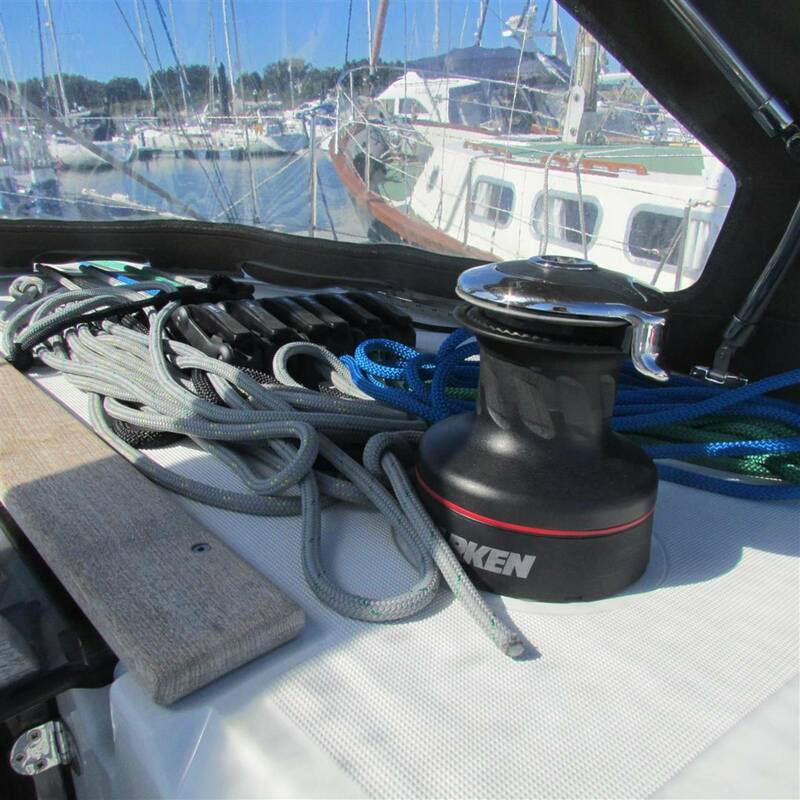 Resulting in enhanced safety whilst sailing. 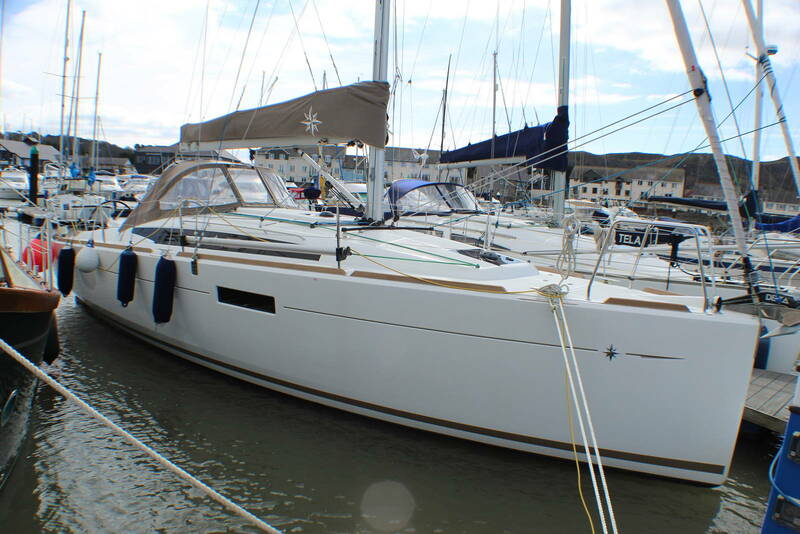 Benefiting a CAT A award, The Jeanneau Sun Odyssey 349 provides enhanced safety when caught out in difficult conditions. This 34ft yacht has a surprisingly spacious cabin area below deck, with large ports in the hull affording ample natural lighting. 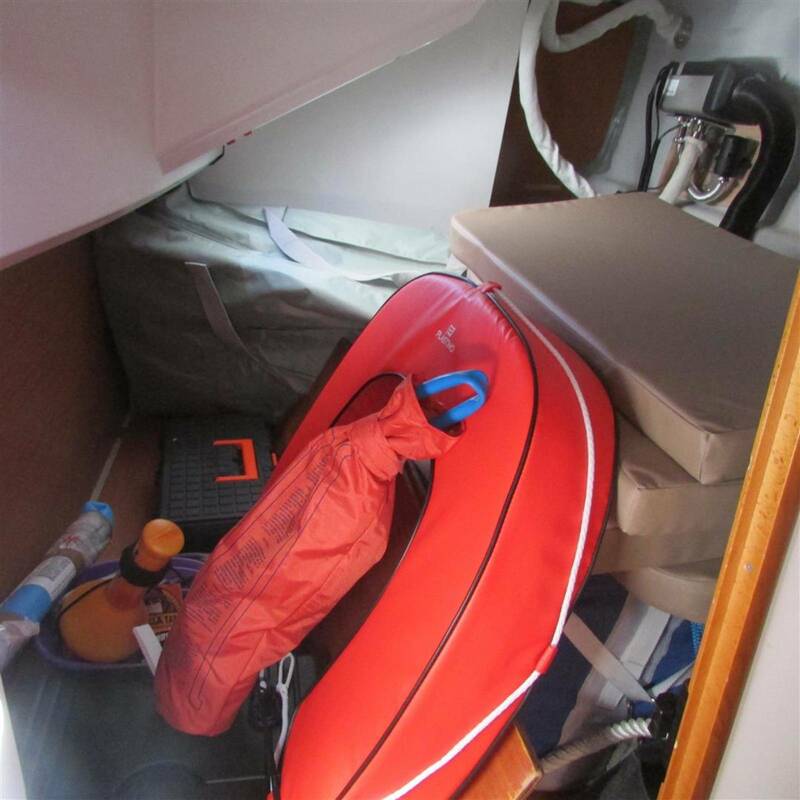 The modern design of this yacht offers ample locker and storage space. 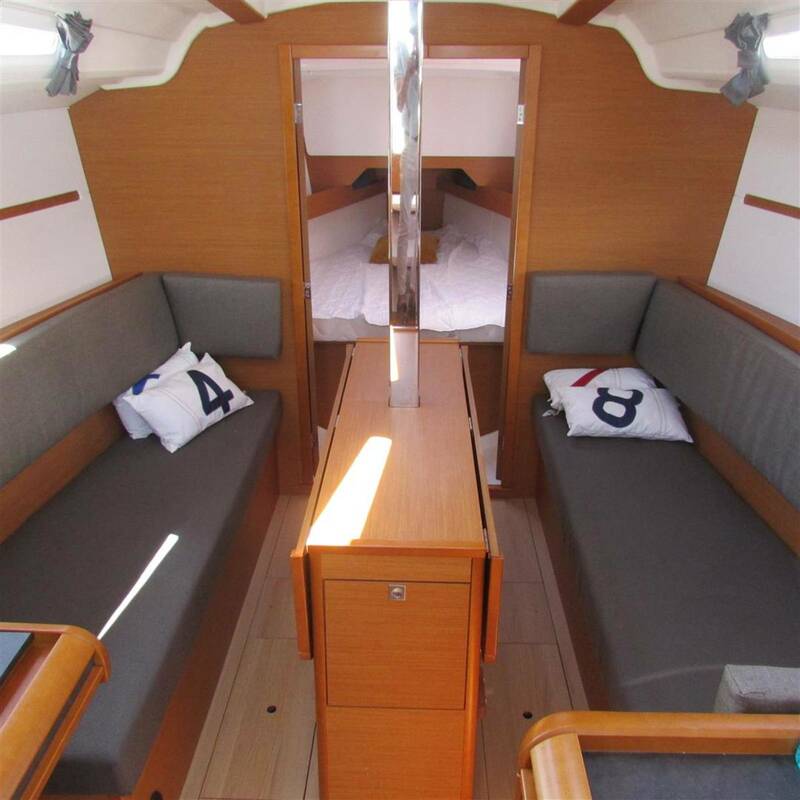 The accommodation is refined with fine teak laminates and trims of solid polished wood, finished with flooring of laminated light oak. The accommodation is highlighted throughout with high quality LED lighting. 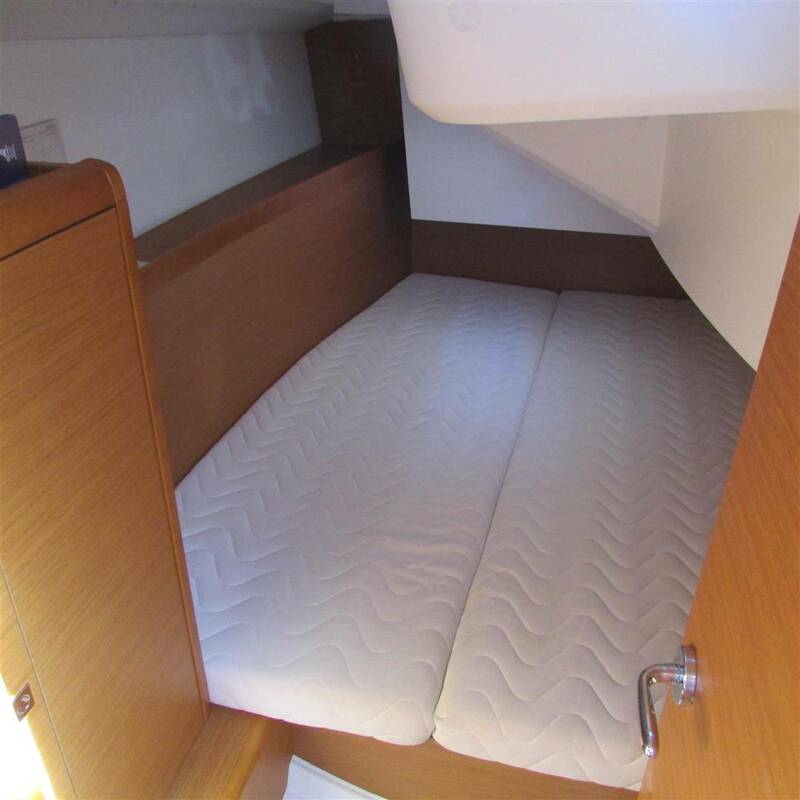 with double berth to the centre consisting of foam mattress finished with a wooden trim. Cabinets providing shelves and hanging space. 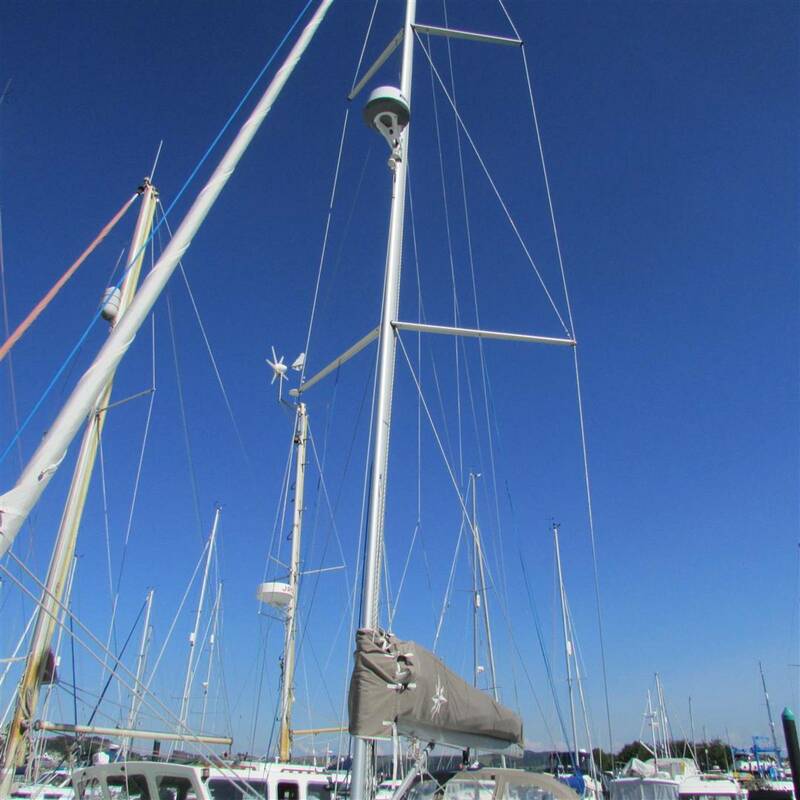 Storage forward of the berth, with additional lockers space below the berth. 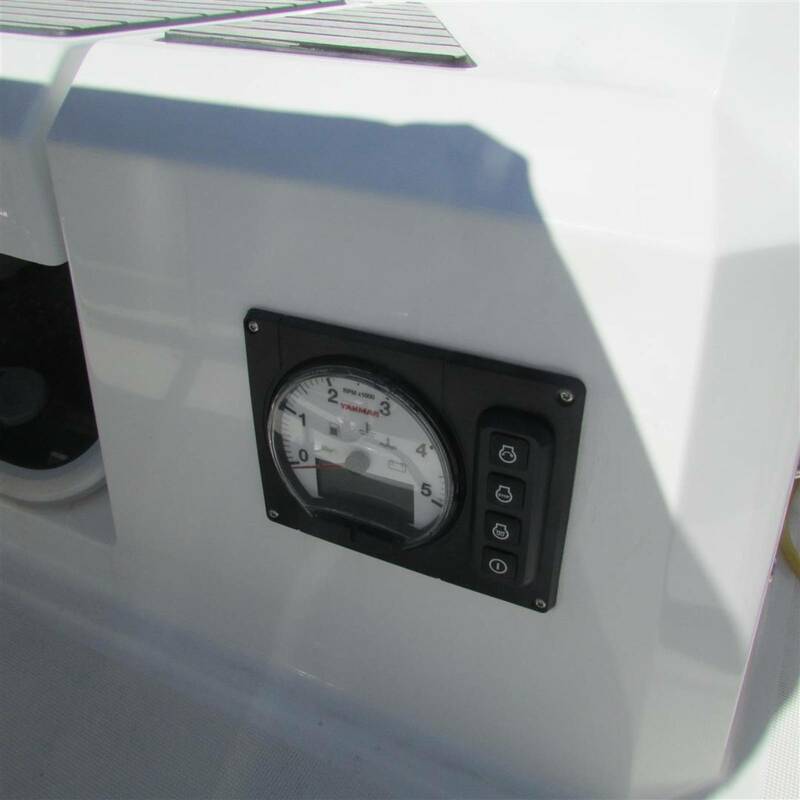 The hull is lined with white vinyl and provides shelving. The double doors provide easy access. 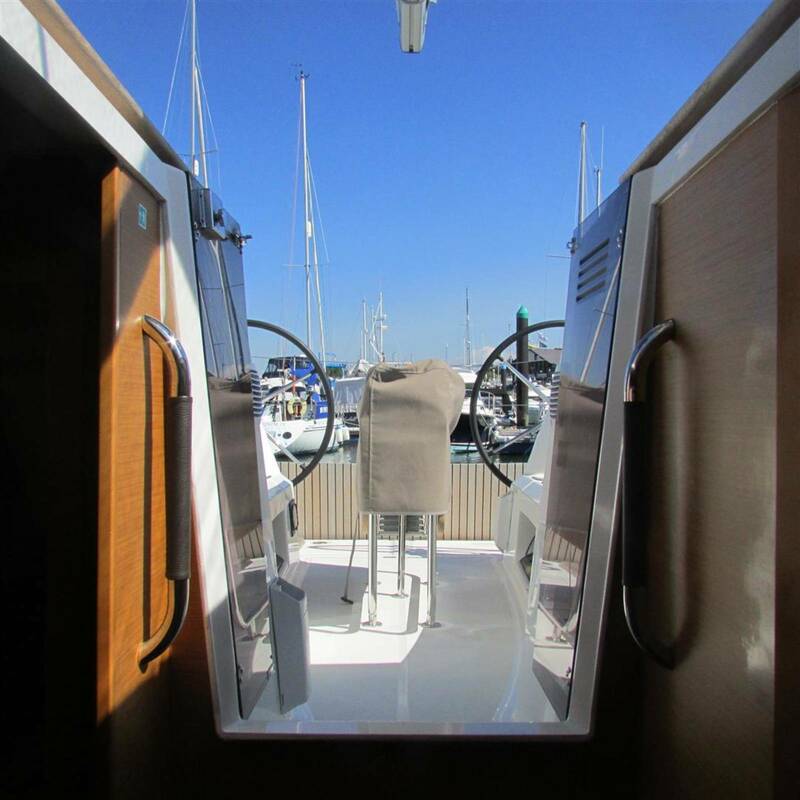 with the added advantage of providing an enlarged cabin area for those social occasions. The cabin is illuminated with LED lighting with the addition of reading lights. 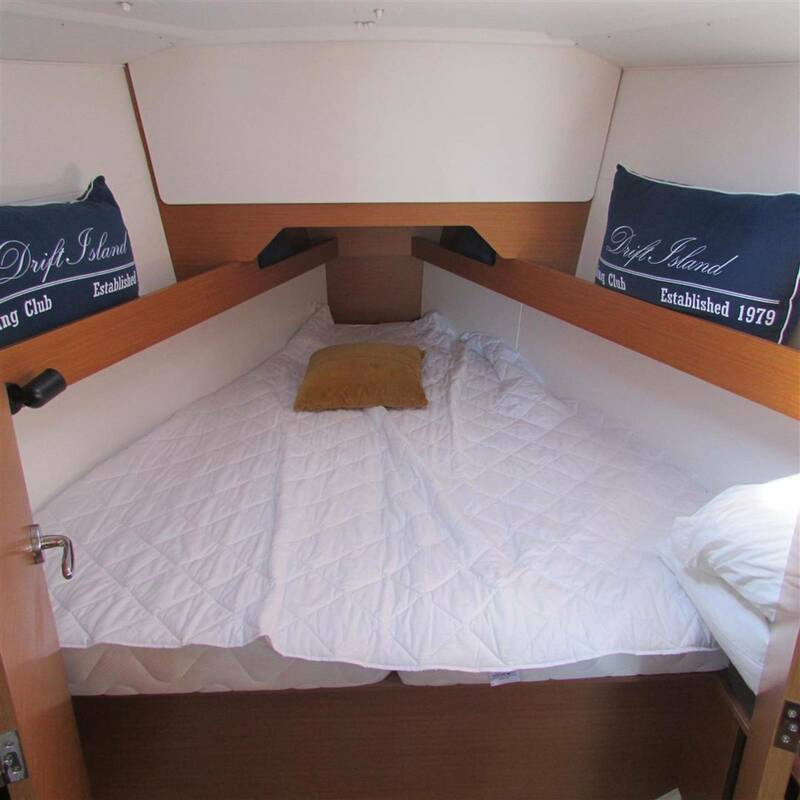 with Large double berth consisting of a foam mattress measuring 6'7" x 4'7" x 3'10" finished with a wooden trim. Cabinet providing shelves and hanging space. 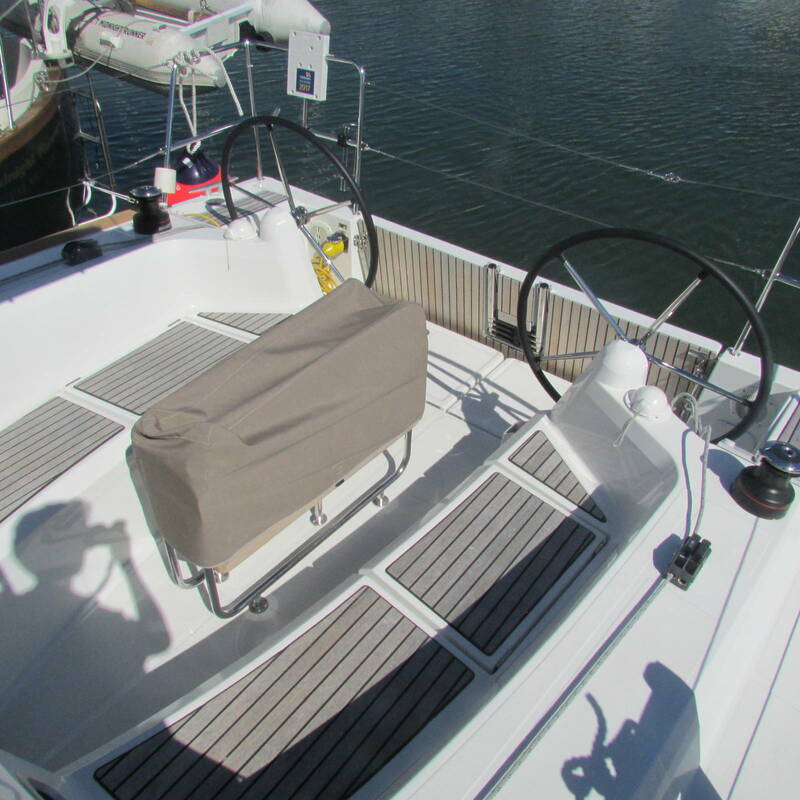 The hull is lines with white vinyl and provides shelving. The cabin is illuminated with LED lighting with additional reading lights. 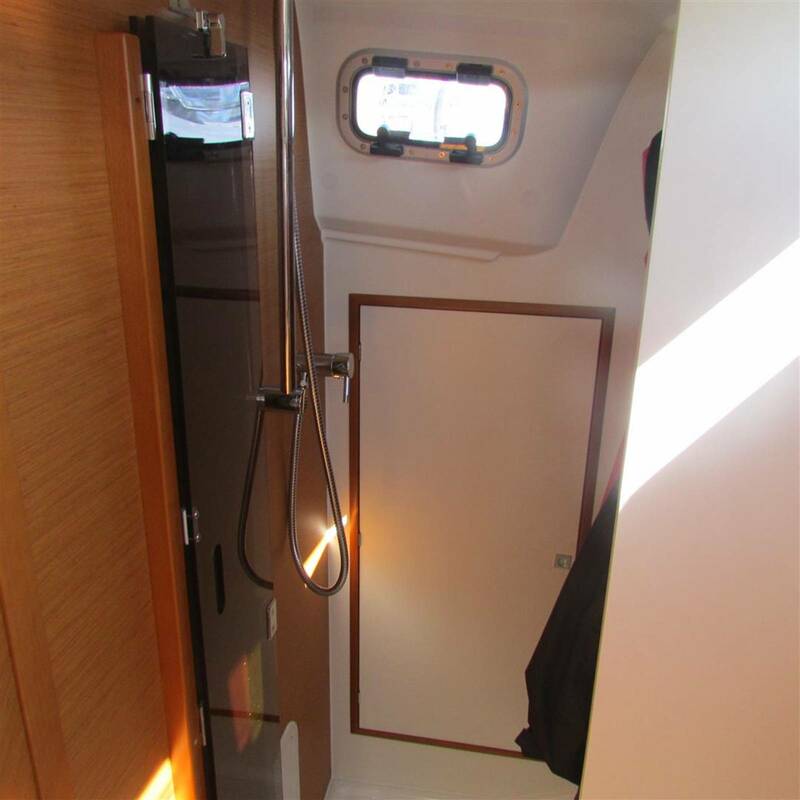 Shower compartment with access to the sail locker. 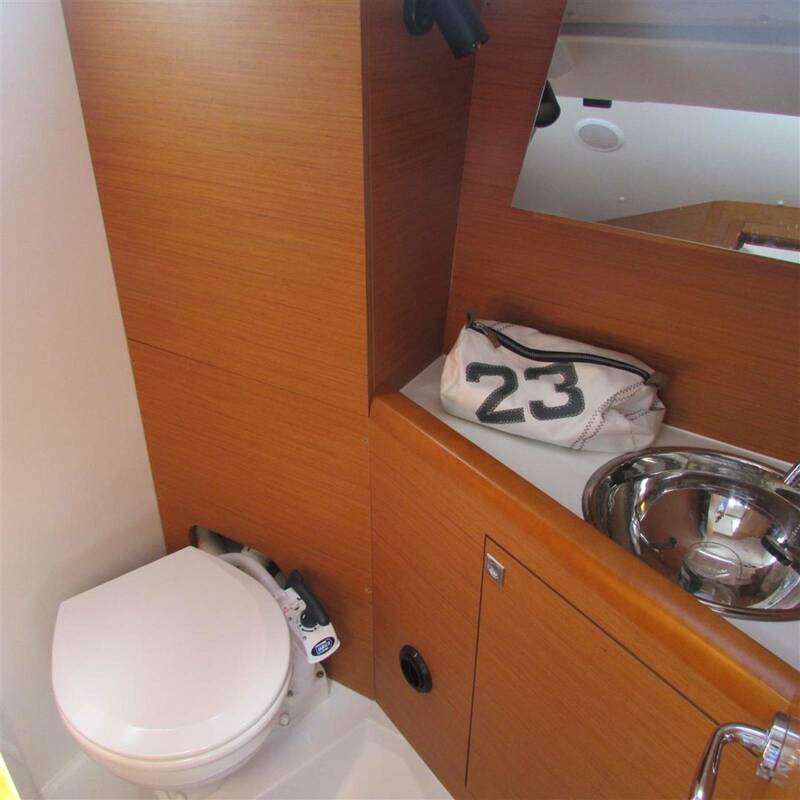 Large aft compartment featuring the head, sink, hooks for clothing, toilet tissue holder, mirror and cabinet over the sink. Shower with roof ports, plexiglas doors and curtains. Comprehensive electrical panel with spare breakers 12 volt socket and voltmeter. Stow away chart table with work surface featuring slate style finish with room for a laptop. Featuring Chrome sink fittings and laminated slate style counter-tops. 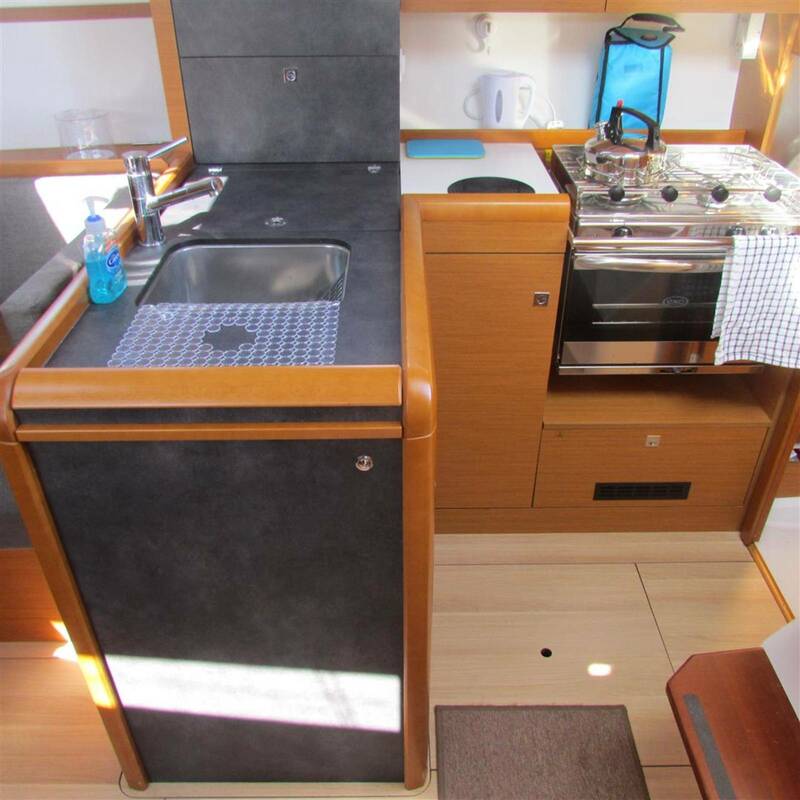 L shaped Galley to the starboard side with round stainless steel sink, cutlery box, ice box, and storage cabinets. 12v volt compressor with evaporator plate in the fridge housing. Luxury two burner stove with stainless steel oven/broiler. with seating and cushions over storage areas. Folding table with fiddle rails. Bar built within the table leg. 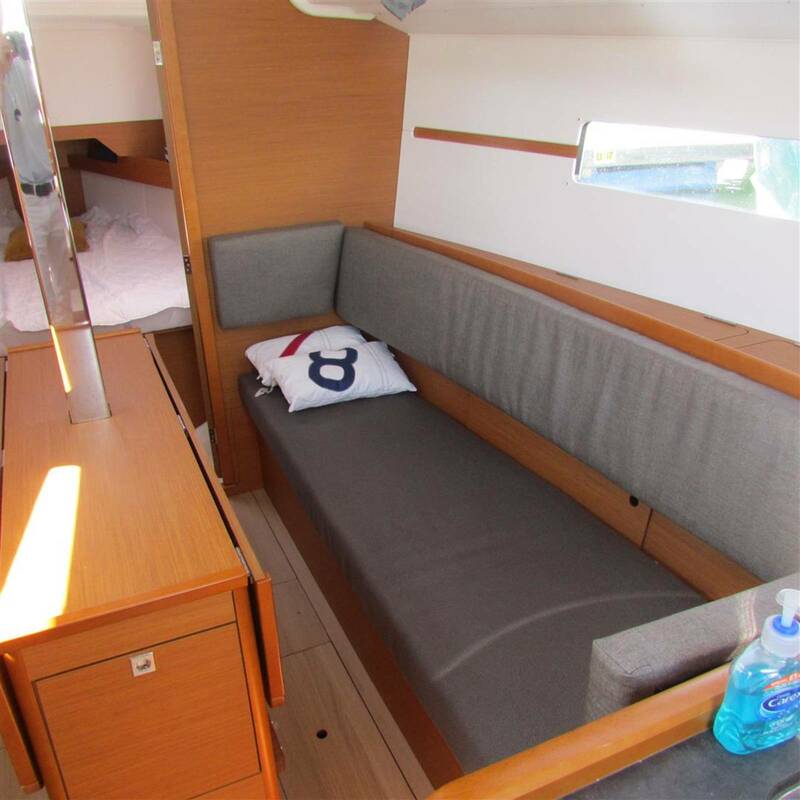 Portside settee converts into a single berth with the aid of a saloon stool which fits beneath the nav desk. 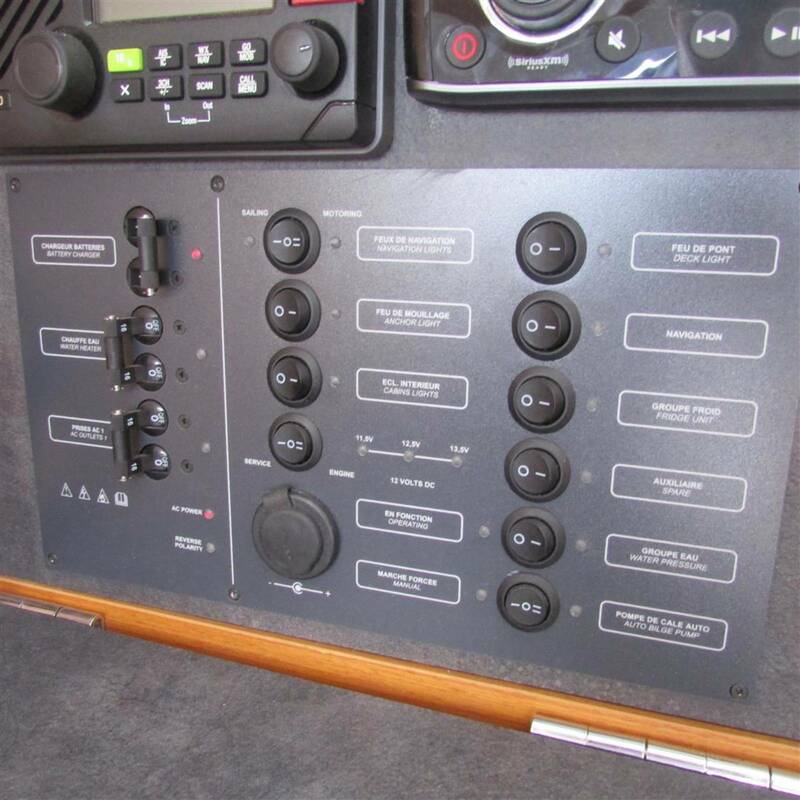 Luxury lined hull finished with wood inserts. 4 varnished steps leading to companionwa ywith plexiglas hatch and hinged door. 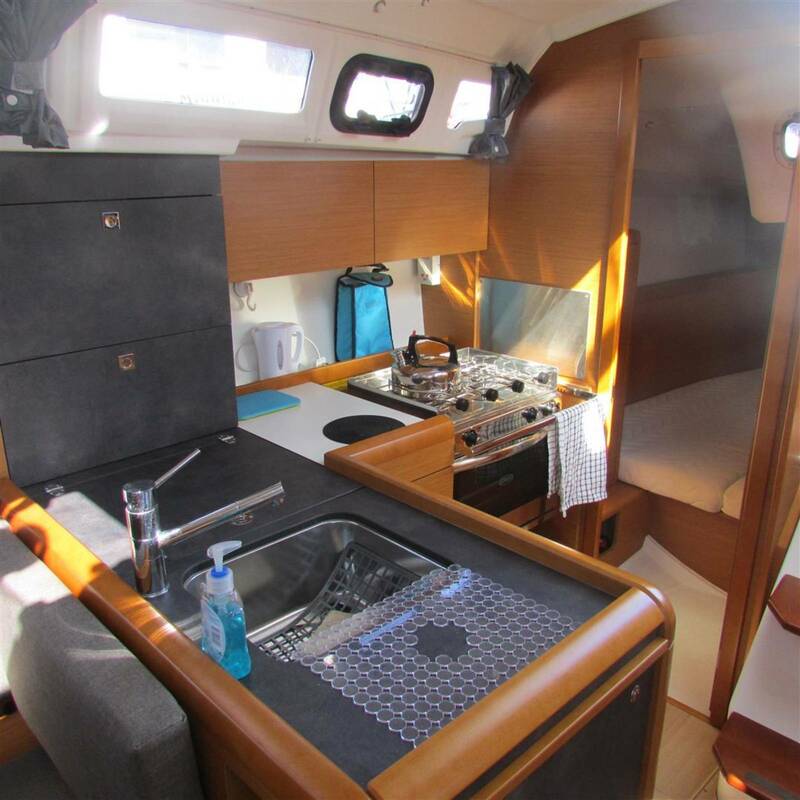 Fine teak interior laminated panels with wood trims to the galley ,companionway and cabinets. Finished with satin UV stabilised varnish. Floorboards of light oak laminate. 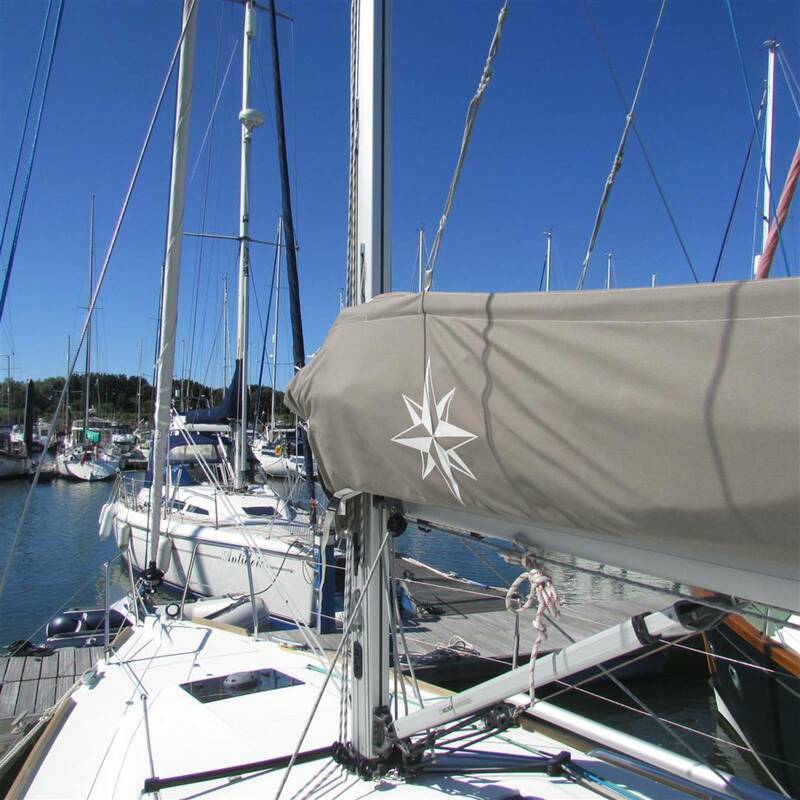 Galley and Aft Cabin 6'3"
Sun Odyssey 349 c/w swing keel and hydraulic ram (2016 Model Year). 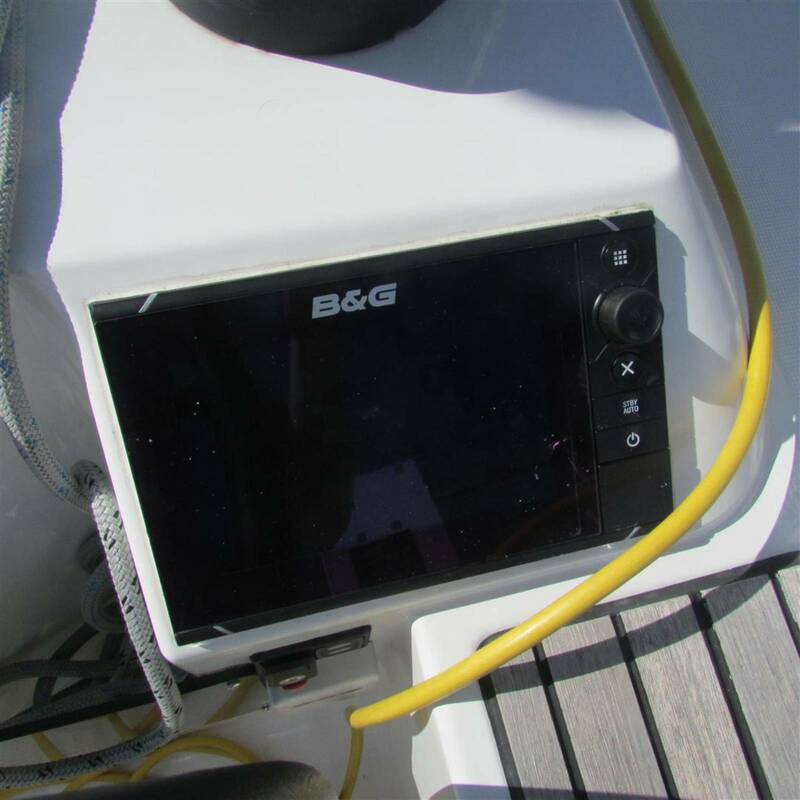 Led Navigation and internal lights throughout the yacht. Cockpit Table With Folding Wooden Leaves - *Replaces the Plastic Cockpit Table (Cockpit table is supplied without protective cover.